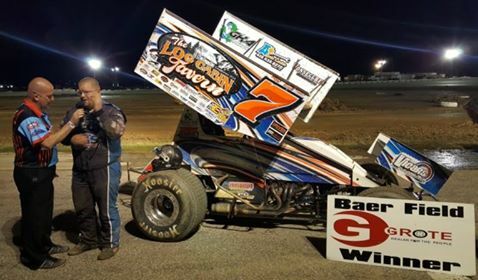 On a night when rain was a persistent threat, Ryan Ruhl drove to the win in the Engine Pro Sprints on Dirt presented by ARP Jim Coffey & Son Plumbing & Heating Dirty 30 portion of the NUVU Fuels Dual On Dirt. Ruhl mastered the 26 car field by being the fastest overall qualifier, dominating the Engler heat, and taking home the SOD Big Money check of $2,000 for winning the feature. 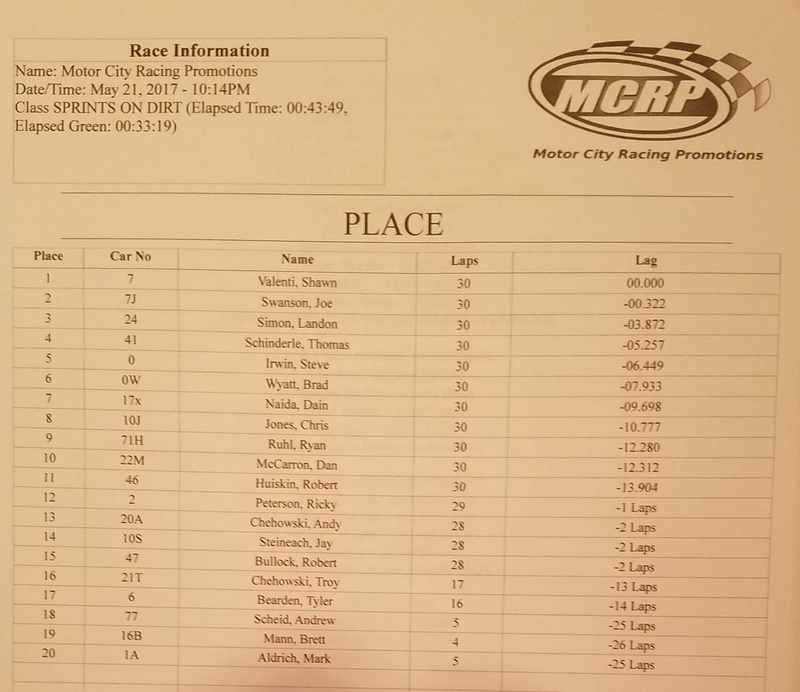 Although rain wiped out several other Michigan race events, it didn’t stop I-96 Speedway’s near-capacity crowd from the rare opportunity to see two headline classes, the Engine Pro Sprints on Dirt presented by ARP and the American Ethanol Late Model Tour in one event. The show was a real crowd pleaser as light rain fell for hours during the program, but never enough to stop the action. Ruhl, in his familiar blue #16, showed his strength early, being the Lane Automotive/MSD Ignition Fast Master in the Engler Machine & Tool Heat group. 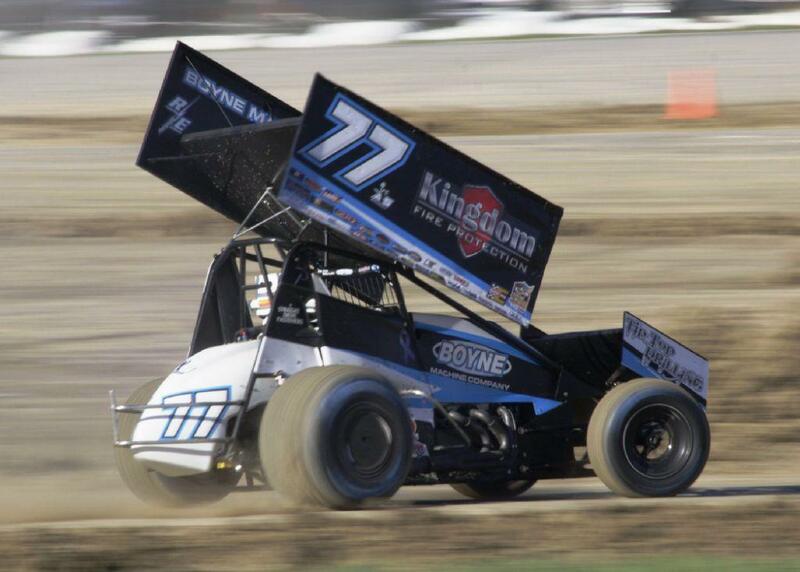 He then drove from his 4th place heat race starting position to an easy win. Not to be outdone, Chad Blonde showed his strength by taking the COMP Cams heat. Steve Irwin took the RockAuto.com heat from 3rd. Eric Smith suffered mechanical woes early in the program as did Brad Lamberson and Thomas Schinderle keeping them out of competition. Jay Steinebach overcame heat problems to take the B-Main from his 6th place starting position. Gregg Dalman took the early lead in the feature over pole sitter Chris Jones. By lap 6, Chad Blonde was on the move taking 2nd and setting sail after Dalman. Blonde took the lead on lap 12 and looked like the car to beat. Dain Naida spun off of turn four on lap 15 just after moving into the top 5 from 10th. At half way it was Blonde, Dalman, Ruhl, Boston Mead, and Joe Swanson. Two laps later, Chris Jones race ending when he flipped off the back straight. A lap later, Ruhl, who started 9th, snatched the lead from Blonde. Brett Mann spun in turn 4 on the next lap and rookie Andrew Scheid was collected by Mann and flipped hard, ending a frustrating night for him. After refueling during the red for Scheid, Steve Irwin, who was in 4th, dropped out with engine problems. Back under green, Ruhl charged to win with Blonde staying within striking distance, but not able to mount a serious challenge. Today (Friday, May 26th) is Race Day! The Inaugural NUVU Fuels Dual On Dirt is at I-96 Speedway in Lake Odessa, Michigan featuring the Engine Pro Sprints On Dirt presented by ARP & American Ethanol Late Model Tour together in one gigantic show. The Engine Pro Sprints on Dirt presented by ARP will be making their one and only appearance in 2017 at I-96. One season ago, Max Stambaugh, now a Rookie of the Year title contender with the Arctic Car All-Star Circuit of Champions Sprint Cars, went to victory lane. 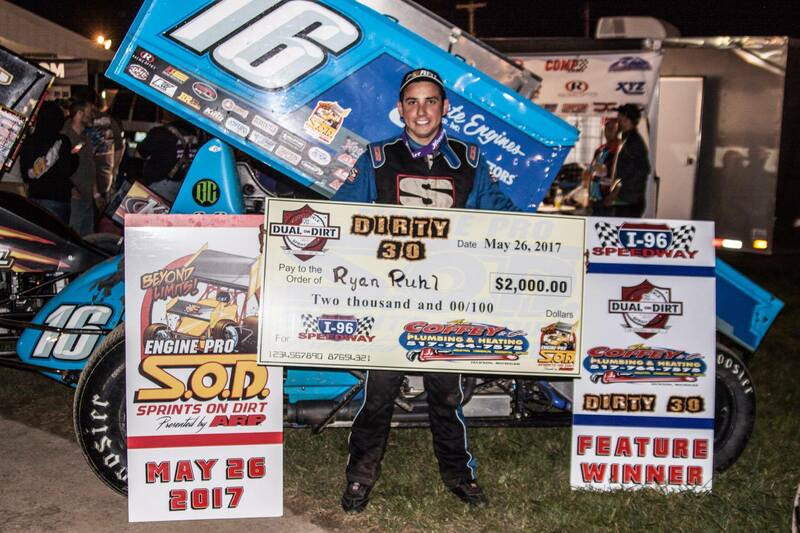 in 2015, it was Ryan Ruhl, the 2007 SOD Rookie of the Year and five-time SOD Champion, Dustin Daggett taking the checkered flags first. This event is the 86th all-time appearance by SOD at the Lake Odessa, Michigan speed plant. Fostoria, Ohio driver, Shawn Valenti would led all 30 laps of the Engine Pro Sprints On Dirt presented by ARP MAHLE/Clevite Beyond Limits Challenge Race #1 at Baer Field Motorsports Park to score his first career SOD victory. 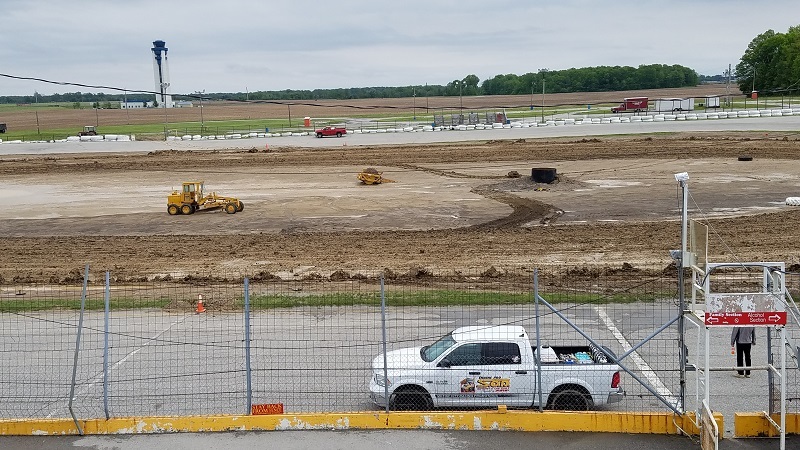 The first race on the Baer Field Motorsports Park new ¼ mile track was originally scheduled for Saturday. Unfortunately very heavy rains turned the track into something referred to as “Baer Lake,” but promoter Dave Muzzillo didn’t give up and surprisingly was able to get the track in shape for the Sunday rain date. Mark Aldrich, Brett Mann, and Thomas Schinderle were Lane Automotive/MSD Ignition Fast Masters for their respective heats. Landon Simon won the Engler Machine & Tool heat after a lap one flip by Greg Wheeler that ended his night early. Brett Mann won the COMP Cams heat, and Dain Naida won the RockAuto.com heat. Dan McCarron took the win in the B-Main. 2015 SOD Champion Gregg Dalman encountered mechanical problems and was unable to resolve them at the track. Four laps into the feature, Mark Aldrich and Brett Mann came together between turns 1 and 2, ending their night. Due to an extended red period, the field was allowed to add fuel. 31-year-old Valenti, in his Log Cabin Tavern / Triple X Chassis entry, held off consistent challenges from former pavement sprint winner at Baer Field, Joe Swanson to take home the win. Swanson settled for 2nd as USAC Racing National Sprint Car Series regular, Landon Simon was third over RockAuto.com heat race Fast Master and series rookie of the year contender Thomas Schinderle who finished 4th, while 2001 SOD Champion, Stevie Irwin completed the top five. Today (Sunday, May 21st, 2017) is Race Day. The third time is the charm for the Engine Pro Sprints On Dirt presented by ARP as the fire breathing, winged warriors are in the Hoosier State. The historic first ever race on the newly constructed 1/4 (0.250) mile semi-banked dirt oval of Baer Field Motorsports Park will be the MAHLE/Clevite Beyond Limits Challenge Race #1 as the SOD Sprints highlight the highly anticipated first dirt event at the Fort Wayne, Indiana speed plant…. Practice starts at 4:00p.m. This is not the first ever appearance by SOD at the Summit City oval as back on September 10th, 1994, during the days of SOD racing on both dirt and pavement, Denny England would take the checkered flag on the tracks’ 1/2 mile paved configuration.